I won't claim that the composite is very good, but the barbwire material itself holds up quite well even fairly close up. In the example image I used the sIBL HDRI set 'Topanga Forest B' from Blochi as found on the sIBL archive and for the wooden posts some textures from CGTextures. 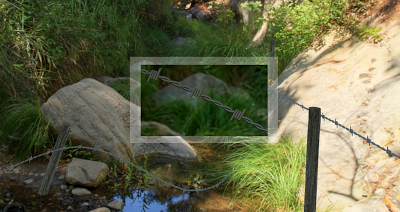 The code for the shader is pretty tangled, mainly because the spikey bit of the barbwire is pretty hard to code. The Xscale input is provided in order to make it possible to reduce the number of spikes per length of wire. By default we generate one spike per two turns. If you want to reduce this, you increase the number of turns, scale your input position in the x-direction and divide the Xscale input by the same amount (otherwise the turns on the spike would scale along and look way to thick).